1. First, let me say ‘congratulations’ on the success of your new book, You’re Not The Boss Of Me, which is #5 on the Los Angeles Times best seller list! Can you give us some information about your educational consulting practice? What services would a potential client receive? 2. You’re the mom of triplets and you have many years experience as an educator and consultant. Does it matter whether a parent sends their child to a private elementary school which serves as a “feeder” to Harvard-Westlake if their goal is ultimately Harvard-Westlake? This is a tricky question. More important than the elementary school (or preschool!) the child attends, is the child himself. Schools are looking for a balanced class, kids from public and private, all different kinds of kids, but kids who will be successful in that particular school environment. But a school needs to be a good match for the child and the family. It is true that some schools do seem to “feed” to the next level. But that is likely more because of it being a philosophical match than it being a true feeder. 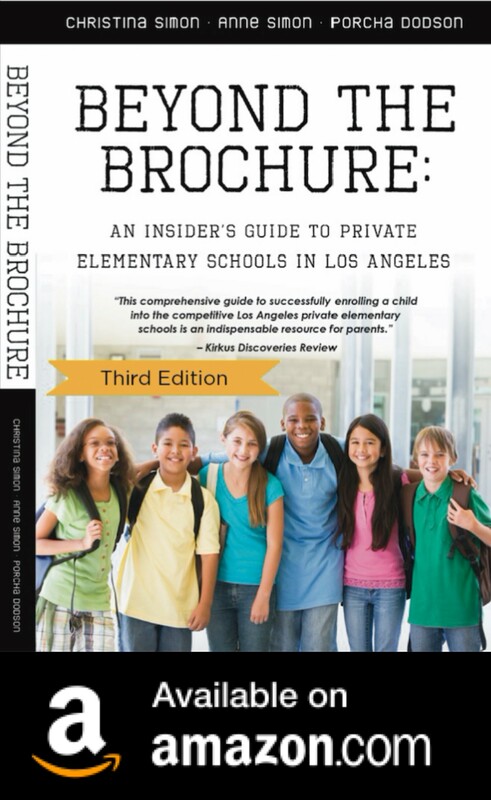 Children who have gone to Waldorf for elementary school are not likely to be well matched, for example, for Harvard-Westlake, though it certainly can happen. A big difference between public and private school in terms of the next step is the degree to which that school will go to bat for the child. As you know, public schools are not able to step up to the plate in promoting a child in his applications the way private schools can. That is a big difference. But it is not a deal breaker. 3. In general, how are your fees/services structured? I am paid per session. A session is 50 minutes. I have different fees for different kinds of consultations. It’s pretty standard. I do some pro bono work with families who really need me and they really need food. I am connected to a particular public school whose population is far less privileged than others. That’s an easy adjustment for me to make in those cases. Often a family sees me only a few times, even only once. If a family needs me more than that, it is likely that something else is going on. There are times when I refer a family out for a different kind of help than I am able to offer. But I like to get them in, help them, and move them out! 4. Why do you think so many wonderful families get wait-listed or declined admission from top private elementary schools? Boy, if I knew this answer to this one, I’d be, well, really popular! The reality is that there just aren’t enough schools for all the wonderful kids and families who are applying. Every child deserves to go to the best school his parents can afford. Actually, I take that back. Every child deserves to go to the best school for him! Sometimes a family just isn’t in the position to afford it, and that’s too bad. That’s when we have to make lemonade. You play with the cards you are dealt. You know my three kids-triplets-went too three different public schools, starting in 7th grade. They had good, solid educations. Could each have had better? Absolutely. But each of my kids did really well and ended up at top notch schools, all the ones you’ve heard of and grad schools too. You know, Christina, I sincerely believe that it is as much about what goes on at home as it is about what goes on at school…if not more. So, why are they declined? I suppose if we are being realistic here, some kids get in for the right reasons and some get in for other reasons. Let’s leave it at that. How I wish the schools were able to do all the research to get to really know their applicants…beyond the applications and the interviews. There’s so much more there. 5. What are some of the schools your clients have attended? My clients attend ALLLLLLLLLLLLLLLLL the schools. You name the school, I have sent a client there. This is a super helpful post. I’ve always wondered what educational consultants really do. Thanks!